When I first heard that "Harry Potter and the Deathly Hallows," the conclusion to J.K. Rowling's modern literary classic, was going to be split into two movies, I was worried it was all about the money. It thankfully turns out, however, that it was really all about the story. The choice for a split in this final installment is an artistic one, and it seems only fitting now after having seen "Part 1." Director David Yates, who directed the fifth and sixth installments, has skillfully guided us through a string of "Harry Potter" films that are consistently excellent. In this most emotionally and cinematically rewarding installment yet, there's a sense of melancholy for the impending end, which arrives next year with "Part 2," as Yates steers us into a more serious, elegant and meditative film about characters we have grown to love and care for, those we have watched since they were children and who are now intelligent young adults taking on the world outside the walls of Hogwarts School of Witchcraft and Wizardry. This is the furthest departure from any "Harry Potter" films that have come before. We receive but a glimpse of Hogwarts, and Harry (Daniel Radcliffe), Ron (Rupert Grint) and Hermoine (Emma Watson) are not there. There are no longer Quidditch matches, classes, uniforms, petty crushes or any sort of adult supervision or guidance--these are all things of the past for our trio. Cast out beyond the walls of Hogwarts, they are on their own separate mission to find the Horcruxes with which to destroy Lord Voldemort (Ralph Fiennes). Albus Dumbledore is dead and gone, and while the trio gets assistance early on from the likes of Hagrid (Robbie Coltrane) and Mad-Eye Moody (Brendan Gleeson), they mostly must remain on their own in order to ensure the safety of those close to them. Harry Potter is a human target with the Dark Lord's Death Eaters on the loose, so they decide it would be better to keep him in seclusion from others, which means traveling through vast wilderness and using Hermoine's endless resources to their advantage. This drastic setting change is jarring at first but takes us to gorgeous landscapes that are captured by luscious cinematography from Eduardo Serra ("Girl with a Pearl Earring," "Blood Diamond"). The journey also takes them occasionally to the streets of London, which adds a shock of realism to what we've otherwise come to know as fantasy. The early portion of the movie wanders a bit, but it works considering the rather directionless nature of their journey at that point. We also wouldn't get some of the intimately detailed moments that we do if there wasn't this slight pause in the proceedings. 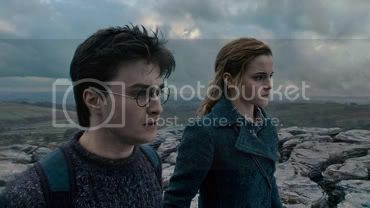 In one of the movie's most poignant moments, Ron has become fed up with waiting around for Horcruxes and storms off leaving Harry, and especially Hermoine, bewildered and lonely. In an effort to comfort Hermoine and lighten the mood, Harry wordlessly leads his friend in a dance inside their tent. This scene is not in the book, but it proves Yates has really come to understand not only these characters but the actors playing them, as well. A deviation from the text such as this comes as a welcome addition, an honestly tender and real moment marking the films and books as separate entities, but also a flourish of which Rowling would approve. A lot of the older British cast is absent (Alan Rickman shows up only once as Severus Snape, and Helena Bonham Carter has one dastardly sequence as Bellatrix Lestrange), which leaves room for the three younger actors to really shine. Radcliffe, Grint and Watson all present their largest emotional range here than ever before. Their performances are accented with touchingly subtle nuances that were conspicuously absent before as the characters begin to struggle with each other as adults, and it's this elevation of feeling from them that makes this first part of the finale pack in the level of emotional grandeur that it does. Tracking the adventure is the brilliant composer Alexandre Desplat, his first time working with "Harry Potter," whose score is haunting and bleak with touches of whimsy. This entry also uses stark silence to great effect most notably during both the opening and closing credits. A daunting chase sequence with Snatchers through the woods cuts out all music, too, as all we hear is the zapping of spells, the trampling of feet on the ground and heaving breaths. Harry, Ron and Hermoine's infiltration into the Ministry of Magic is cleverly handled as is the telling of the story of the Deathly Hallows, which is presented with shadowy figures of animation that have a nice effect. The return of the house elf Dobby is also a welcome treat. Yates and screenwriter Steve Kloves have set their formula, which has become especially familiar to us since "Half-Blood Prince," to even greater effect here with a perfect blend of pathos and humor. While each entry certainly has been darkening in tone and mood, things have now turned to pitch black. "Harry Potter and the Deathly Hallows: Part 1" is the slowest and saddest installment yet, beautiful and heartwrenching in its own right and a satisfying and standalone entry even when it ends at the midpoint acting as a stepping stone. "Part 1" braces its characters and its fans for the series' finish as we await with anxious suspense and a tinge of looming dread perhaps because we well know the next time is when we say goodbye.